The Herrerasaurus or “Herrera’s lizard” was named after the Rancher who discovered the first ever fossil found of this animal. It is thought to be one of the earliest dinosaurs, because carbon dating has dated it back to the early Carnian age, which is the late Triassic Period which was around 228 million years ago. It was found in northwestern Argentina. 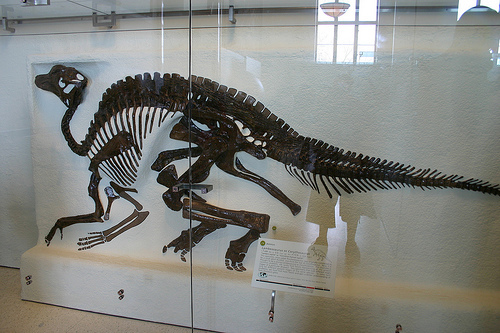 There is only 1 species in this genus, Herrerasaurus ischigualastensis. For many years, the Herrerasaurus’ scientific classification was unclear because it was only known fro very few fragmentary remains. These fragments were debated to be different types of dinosaurs, or not even a dinosaur at all! However, a complete skull and skeleton was discovered in 1988, so Paleontologists have been able to classify this dinosaur better. The Herrerasaurus is a bipedal carnivore that has a long tail but a small head. It was estimated to be about 3 – 6 metres long, and had a hip height of over 1.1 metres. It is thought to weigh about 210 – 350 kg. The skull of the Herrerasaurus is long and narrow. They can be about 30 cm only, which is relatively small. Its skull did not have any specialisations that are characterised by later dinosaurs so it does look like a primative archosaur. However, it did have 5 skull openings, 2 of which were for its eyes and nostrils. There are also slit holes, and behind the eyes was a infratemporal fenestrae. The purposes of these holes were to reduce the weight of the skull. The Herrerasaurus had a flexible joint in its lower jaw, which allowed it to slide back and forth to have a grasping bite. This is unusual amongst dinosaurs but it has evolved in some lizards. The jaws had large serrated teeth for biting and eating flesh, and its neck was both flexible and slender. 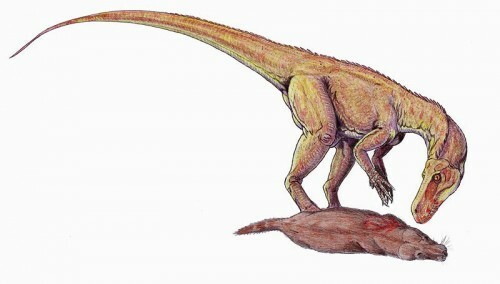 The forelimbs of the Herrerasaurus were less than half the length of its hing limbs. It had 2 fingers and a thumb that had sharp and curved claws which were great for grasping prey. It did had 4th and 5th digits, but these were just small stubs that did not have claws. Paleontologists call the Herrerasaurus an enigma, because it displays traits found in many different disosaur groups including traits found in non-dinosaurian archosaurs. Some traits found in other dinosaurs include its hip and pelvis area, pubic area, and more. According to the teeth found, it indicates that it was a carnivore. The size of the Herrerasaurus indicates that it would have preyed upon both small and medium sized plant eaters which may include other dinosaurs like Pisanosaurus, rhynchosaurs, and synapsids. Fossilised dung (coprolites) were also found that contained small bones. However, no plant fragment were found. 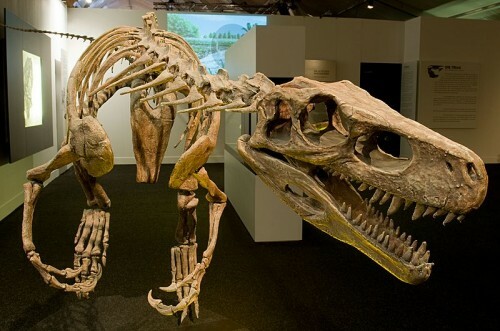 As a result, it is thought that the Herrerasaurus could digest bones.